This was inspired by the following beautiful post….. This entry was posted in elemental, mindfulness, poem and tagged beach, coast, Haiku, mindfulness, nature, photography, poetry, relaxation, silhouette, spiritual. Bookmark the permalink. Soothingly beautiful! And your lovely ones! The spell of the shore, the magic in the sand, the healing of the water. Fabulous light in this shot. Thank you for your kind words. Lovely haiku Seonaid. Happy Fall! Ahhh, Fall as it shines on your seashore… gorgeous. I’m NOT a poet and I know it, but yours is exquisite! Thanks as always Gwynn…..haiku is great practise at being concise for me…..something I’m not naturally very good at…..there are after all so many beautiful words begging to be used! yeah, untangled softly… Exquisite photo, Seonaid! Lovely image and haiku, Seonaid. 🙂 I’m missing my beach. It’s just beautiful, the sea shore is wonderful. 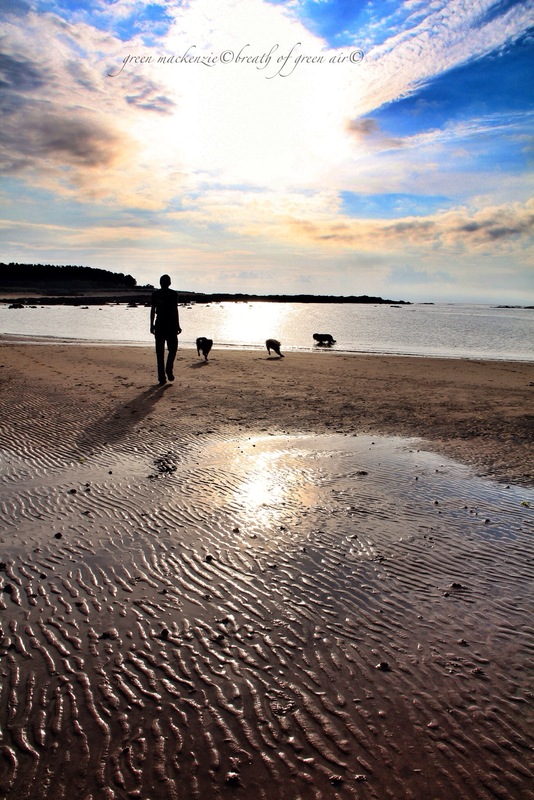 Thanks Gilly, the sand ripples and the low light were a gift….and of course my companions were beautifully placed! Wow thank you very much. Your haiku is the perfect response to my post. Thank you Seonaid – that is such a valuable comment – it helps me focus on what’s working in my writing. I must say I return the compliment to you and your photos are truly inspiring. That shot was taken a few weeks ago, and it was a really lovely evening, walking and unwinding with my son and the dogs.